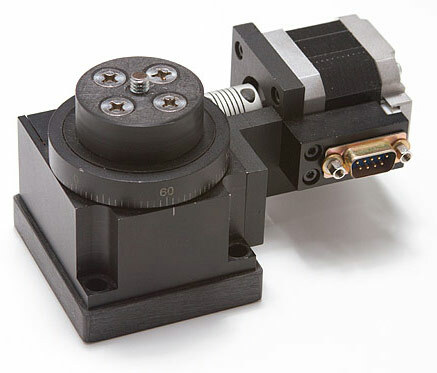 We're working on a new motorized panning head that's much smaller than our previous designs. The diameter is just 2-1/2 inches and the weight is 2-1/2 pounds. The entrire body is made from anodized aluminum, and is much more portable for packing in to remote locations. 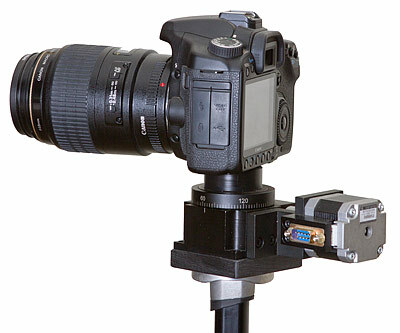 The mini pan head will support a full-sized DSLR camera. A couple of sample movies made with the new pan head can be seen on Vimeo. Our new motor driver is smaller than the one previously used by our 4" rotary table. It also draws much less power for longer battery life. It's just 5" long, 3-1/4" wide, and weighs less than six ounces. It will run a stepper motor more than 10 hours on eight "AA" alkakine cells. Click here to see a battery life graph driving the miniature pan head. The new motor driver relies on pan programs in the Moco Time Machine to vary the amount of travel between exposures. The minimum increment of travel is just .00125 degrees per step. When more aggressive motion is needed, the driver can be switched to a coarse step mode, where each step is eight times larger. A complete rig for ramped panning time lapse weighs less than 8 pounds including the miniature rotary pan head, a lightweight tripod, the Moco Time Machine, and the Mumford Motor Driver.